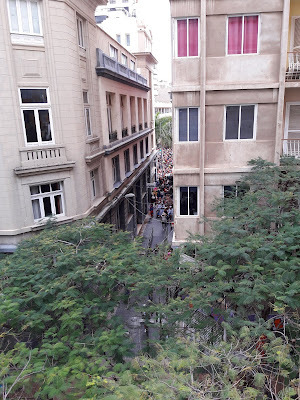 The name of Felipe Campos, the lawyer who represented residents in the noise complaint against carnival in 2006, returned to the memory of many on Friday 1 March at the end of the Opening Parade when they went to the area of El Orche. That night they discovered that the music could only be heard inside the bar that gives the area its name and where, only about thirty people fit at the most. Outside, were three kiosks where you couldn't hear the music, which made people think that maybe it was a problem with the supply of electricity. It was a sound problem. Perception was that Carnival had been muted. The second day of carnival the volume had improved compared to Friday, which wasn't difficult. Sound inside bars is limited to 96 decibels, as in other years, while the music in the outdoor stages is limited to 105. (Rock concerts usually reach 110 decibels.) The mayor convened an urgent meeting on Monday 4 March to discuss the situation that had aroused outrage, where many considered that the limits are very restrictive. 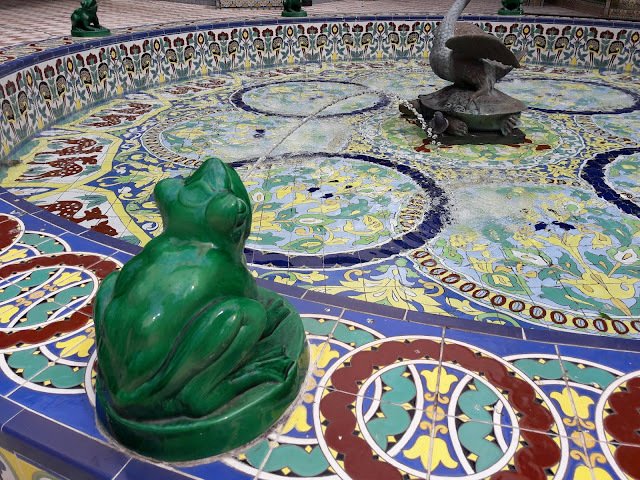 Meanwhile, a Neighborhood Association, in the historic center of the Tenerife capital, has announced that, from June, when the new municipal corporation is constituted, it will seek an agreement with the City Council to definitively resolve the problem to reconcile the right to rest of the residents in the area of the Carnival with music at high volume. They are seeking to have the street parties moved away from the centre of the city. 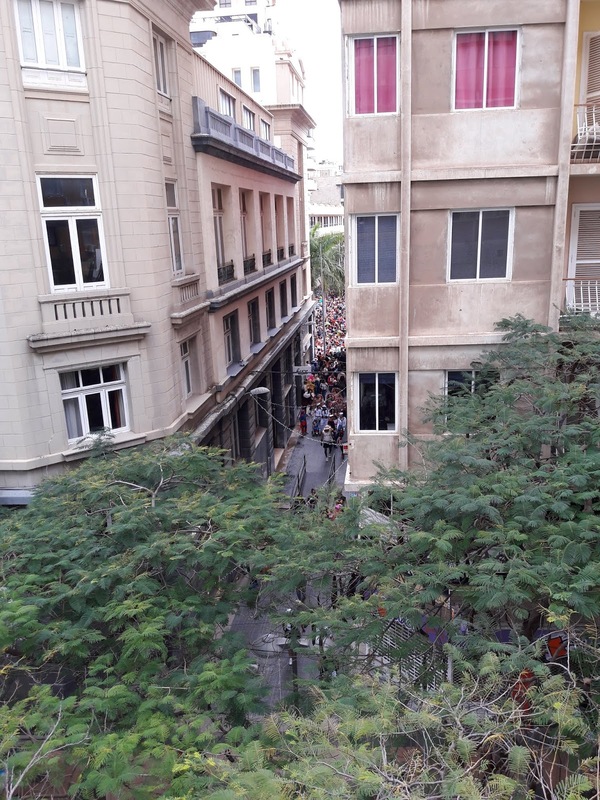 The association have called for a public meeting on Wednesday and ask for what they call the "macrobotellón" (bottle party in the street) to be transferred to the port area in 2020. They claim noise levels during carnival in 2019 were higher than allowed in some areas. Yes, it was noisy, but the loudest wasn't the official carnival stages, it was the kiosk that was virtually below our balcony in the narrow pedestrian street, particularly when they played thumping techno music on one of the big party nights. We still managed to sleep through that and, ironically, woke up once the music stopped in the early morning! The loudest that the 'official' entertainments got was on the Sunday afternoon, during the Daytime Carnival when Billo's Caracas Boys were performing. Staying so close, I can now say that I've HEARD Billo's live. The crowd in the Plaza de la Candelaria was already spilling over into the alleyway opposite, so we weren't going to get much closer to the stage than we already were and decided to stay in our comfortable listening position. There's a perception with some that the loud carnival music is all night, every night, for an interminable period. In reality, it was only on some of the nights: After the Friday opening parade the street parties lasted until 5 am. On the Saturday night / Sunday morning, until 6 am, but the Sunday night, was restricted to midnight. The Monday night / Tuesday morning (the Tuesday being a public holiday in the city) was another late one until 6 am, while the Tuesday night again ended at midnight. Wednesday night / Thursday morning's party after the Burial of the Sardine did go on until at 3 am, but was mostly centered around the one area of the Plaza del Príncipe. There was no music on the Thursday night. For the second and final weekend of carnival the Friday and Saturday night parties would end again at 5 am and 6 am, respectively. So, the loud "all-night" music is actually just five nights in the entire year, four of those are weekend nights and one the night preceding a public holiday. It seems to me to be the extreme of fussy to make a complaint about that. 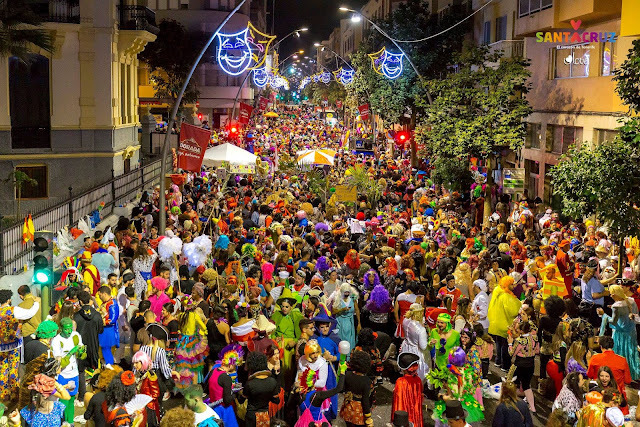 UPDATE 5 April 2019: The mayor of Santa Cruz de Tenerife, José Manuel Bermúdez, has asked the municipal secretary to study what legal options can be proposed to protect the Carnival in the street, either through some legal modification or with a proposal of law in the Parliament of Canary Islands. Speaking to reporters, he said that the goal is "to protect the tradition of Carnival", which has been carried out specifically in the streets and squares of the city for many decades, long before the "veiled threat" of judicial claims by the neighborhood association 'El Perenquén'. According to the mayor, the Carnival is the only Canary Islands festival declared of international tourist interest and "it taking place in the streets is essential". The proposal put forward also includes the possibility of requesting from Unesco the declaration of the Carnival as Intangible Heritage of Humanity.